Exactly what I've been looking for. Frankly, you just don't get enough sass on menus these days. A certain Big Event last year has seen us take advantage of various reasons to celebrate. Cumulus Inc has served us well on two visits - one with a family group of 14 that was every bit the Special Occasion, and the second time just the two of us, no reservation, at the bar, enjoying the rapport with the waitstaff as much as the characuterie selection we demolished down to the last pickle. 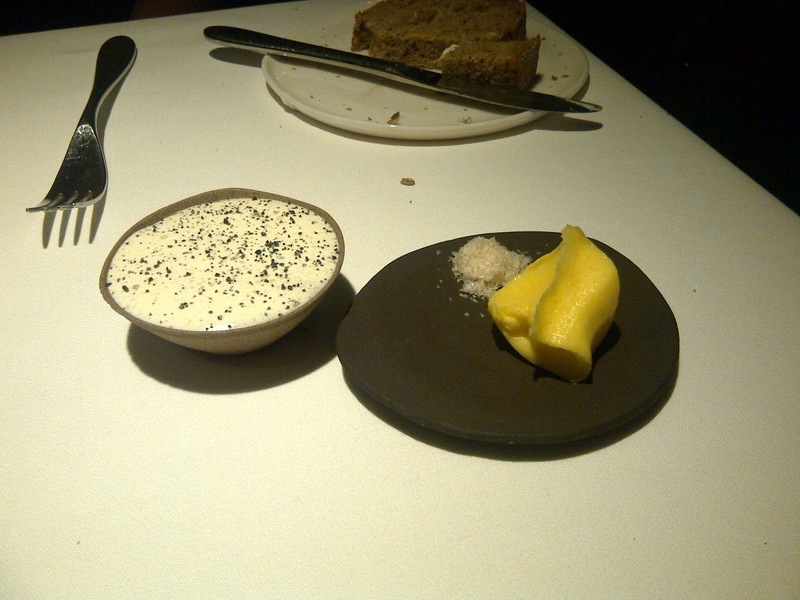 Rockpool delivered the goods in terms of venue and atmosphere (and celebrity spotting, with Kylie Minogue there taking her parents out to dinner, Spanish underwear-model boyfriend in tow), but also a less-than-perfect service story that's still doing the rounds. The apotheosis of the food side of our celebratory journey came this week with a long-awaited visit to Attica, the little restaurant that could. Attica is Melbourne's only representative on the San Pellegrino World's 100 Best Restaurants, coming in at number 53. (Sydney has three restaurants, which seems a crazy representation of the Australian dining scene. Then again, one article mentions that the setting for Attica 'is no match for most of the other restaurants on the list', which tells you something about the prerequisites for inclusion). The fact that a suburban restaurant, tucked in a shopping strip just down the road from Ripponlea station, is punching it with the big guys from Paris, New York and Tokyo, says so much about the quality of food coming out of Ben Shewry's kitchen. The restaurant is also current holder of The Age's Restaurant of the Year gong, and last year Shewry took out Chef of the Year. Shewry is disturbingly young for what he's achieved. Growing up in country New Zealand, he developed a taste for both cooking and foraging as a kid. He's famous for gathering wild-grown ingredients on a daily basis then incorporating them with remarkable success into the dishes at his restaurant. In interviews, he frequently refers to wanting to recreate the emotion and nostalgia of his childhood on the plates of his diners. Tuesday night is budget night at Attica, as much as a five-course degustation for $95 represents a cheap night out. It's the night that Shewry and his team try out new creations, which are often riffs on dishes already settled on their regular tasting menus. An extra $70 gets you matching wines - not a bad choice when few of the by-the-glass options come in under $20. In the high-dining stakes, bread and butter has become a restaurant's, well, bread and butter. At Attica, we received a rye sourdough, with a curl of butter churned from creme fraiche, and cold-smoked olive oil that's whipped at high speed then dusted with black salt. The result is a moussey confection that retains a strong olive flavour without the acidity that can come with the oil in its (more normal) liquid form. The dish was finished at the table with a dram of chicken stock. Snow crab is a deepwater crustacean whose pale shell is responsible for its name. 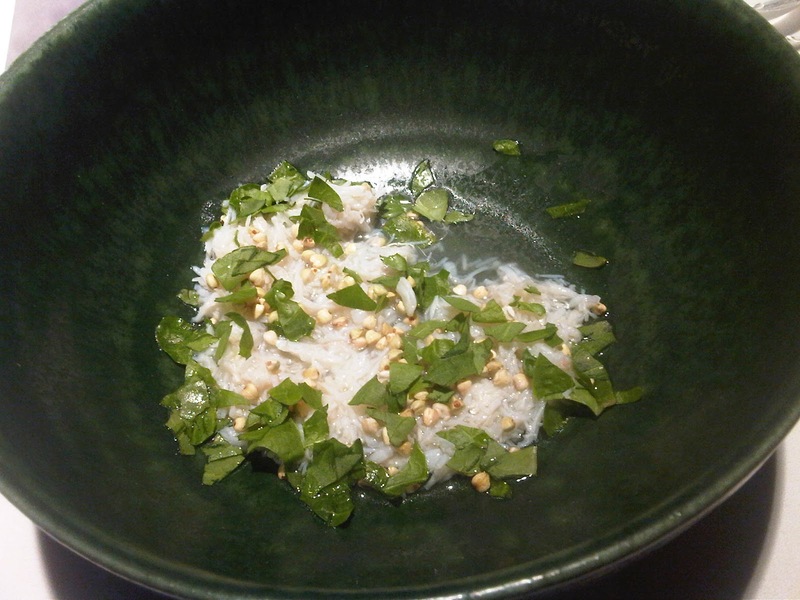 The crabmeat was slivered into pieces that resembled vermicelli noodles in texture. The crunch from the toasted buckwheat provided a remarkable textural contrast. The matching wine was in fact a sake - Uehara 'Soma No Tengu' Junmai Ginjo. Our sommelier was good enough to explain the relevance of each of those words, information I won't pretend to have fully understood or to now recall! 11 basils?? I hear you mock. 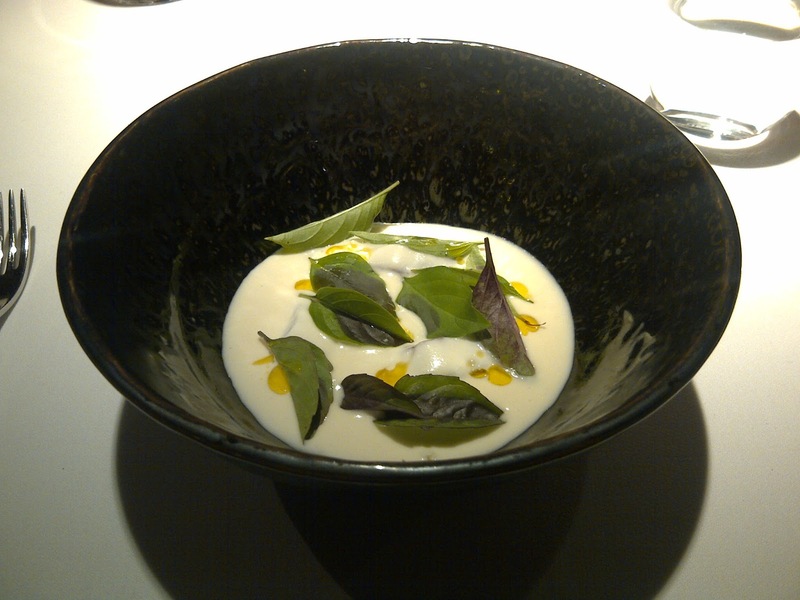 Well, count 'em - there are in fact 11 basil leaves on the plate and every one of them tasted different. The soup is a rich combination of cauliflower and goats cheese, and lurking beneath are chunks of smoked eel and crumbles of roasted cauli. Moving even further away from the wine list, the matching beverage for this course was a beer - a Belgian Chimay Grande Reserve. The third course again featured seafood, this time Marron and Quinoa with a Sauce of Cured Pork Fat and Onion. A note here about the tableware. Some plates are made for Attica and some are sourced from Made in Japan in South Melbourne. Their dark mottled surfaces meant that often the dishes seemed to leap forth from the plate in a trompe l'oeil effect. 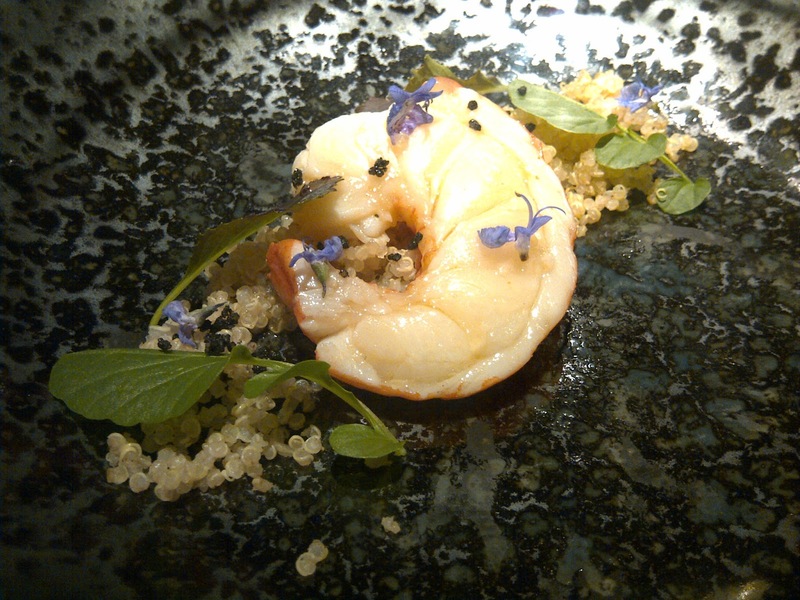 The marron (or crayfish) is strewn with rosemary flowers, and the 'sauce' is a mere glaze on the flesh. The matching wine was a 2012 Bobar Chardonnay from the Yarra Valley, quite the strangest smelling wine I've tried - it made me think of sour milk - but it worked wonderfully with the dish. 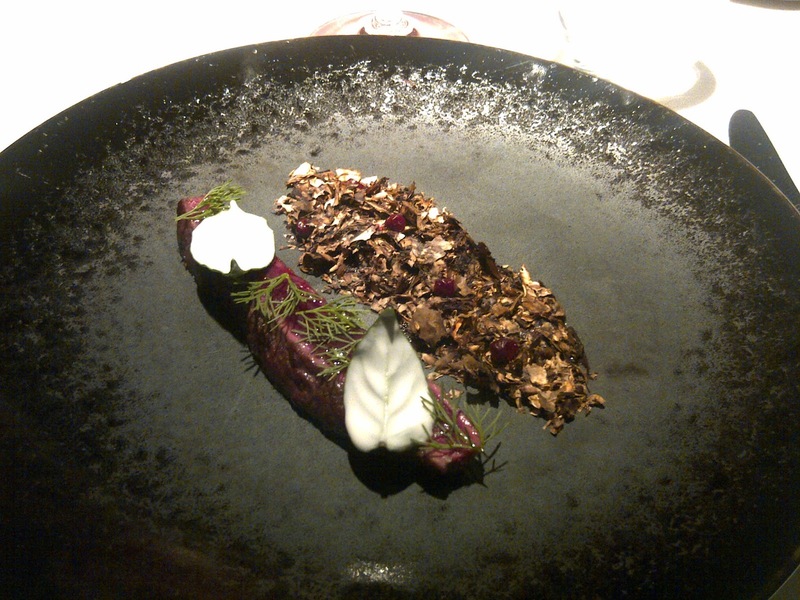 The last savoury course was Wallaby, Dried Mushrooms and Sea Wormwood. There is so much going on with this plate. The sea wormwood is a herb from Attica's garden, and tastes, wait for it, exactly like cola. The large leaves are mushroom leaves, not from the fungi, but from the confusingly named mushroom plant. The piece of wallaby is seared only and completely rare in the middle. It was superb. The jumble next to it features a smear of pureed wallaby black pudding underneath - looking remarkably like melted chocolate - with a mix of cooked and dried mushrooms topped by red currants. The delicious wallaby aside, of the five courses this one didn't quite reach the same level of surprising and successful marriage of textures and flavours. The matching wine, however, was my favourite. A 2009 nebbiolo from Ar Pe Pe in Lombardy, Italy. Thence to dessert: Banana, Caramel, Kaffir and Native Lime. Buried on the plate is a roast banana, sitting on a caramel sauce. 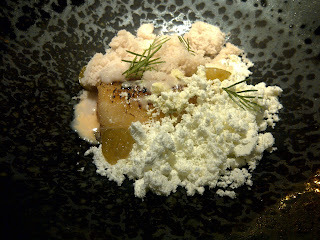 Atop are a banana ice cream along with powdered kaffir lime, and a few slices of native lime. The plate arrived steamingly cold, and as different temperatures and textures intermingled the whole dish fogged intriguingly. Eaten bit by bit, the dish didn't seem all that promising. As all the flavours meshed, however, it became a dessert wonderfully balanced between cleansing and sweet. Alongside was a 22-year-old Auslese from Moselle. Decidedly unsweet, it fairly zinged when sipped after eating some powdered lime. Thus we came to the end of the printed menu. But one more dish was to come. We'd been eyeing these off as they came out to each table throughout the evening. These were preceded with a whimsical story, printed on the back of a drawing of the Kiwi pukeko bird by the chef's father. I wasn't quite sure how the analogy of the pukeko - a 'confident, inquisitive and vociferous' bird - to the life of a chef worked, but dear lord, these were exceptional. Once the white chocolate shell was pierced it revealed a filling of that most wondrous of creations - salted caramel. 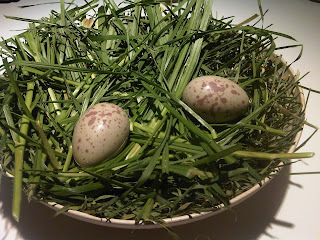 The eggs were a delectable end to a meal wherein contrasts of textures were as notable as strong and surprising flavours. It wasn't the most sustainable meal, with at least one ingredient from most if not every course hailing from interstate, but it was perfectly satisfying. A final word on the service. The same article mentioned above also referenced the service at Attica as one of the elements not at a high standard. Allowing that any restaurant can have its good and bad nights, at Attica we received some of the best floor service I've experienced. The team ran like a well-oiled machine, working in unison to bring and clear wine and plates of food in a seamless fashion. Courses were timed with sufficient pauses to allow for digestion, without dragging out into an overnight stay. The dishes were explained patiently and clearly, and any questions were answered enthusiastically.